A little while ago I had the pleasure of working with Lisa from This Beautiful Day on one of my favorite media kit designs to date. She provided gorgeous photos, pointed at magazine-style media kits for inspiration, and gave me free rein over her existing branding. I had a blast putting this together, and I’m excited to show you guys the full result. Lisa was incredibly easy and fun to work with, and I’m really pleased with the results of our collaboration. I hope you guys like it too! I keep telling myself to make a media kit, but I can’t get up the motivation. They always look really nice though. This is a gorgeous design! 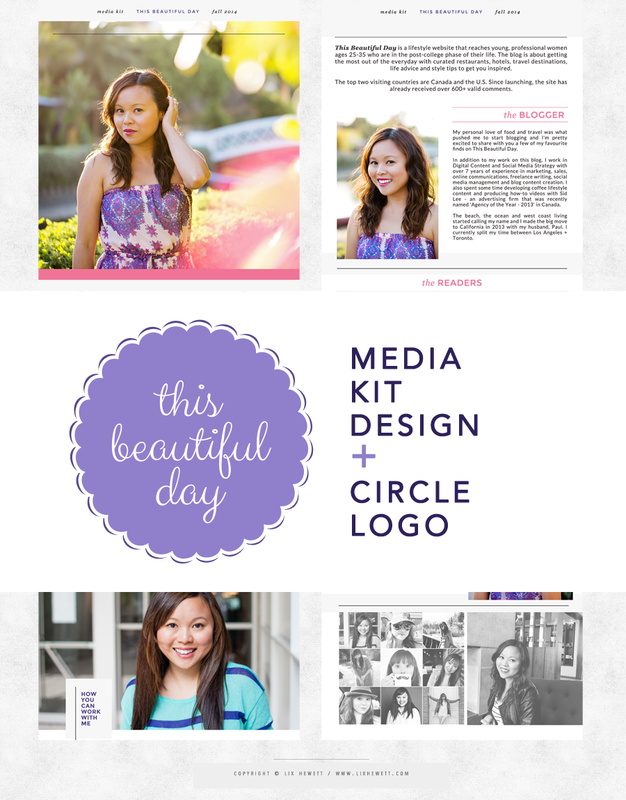 I love looking at other people’s media kits–they inspire me. :) Plus, I love this one a little more than others I’ve seen since it’s got a LOT of purple, which is my favorite color. Great job! Thank you! I love looking at other people’s print design work so it’s only fair for me to share mine (and the self-promo that goes along with it can’t hurt, right?). Lisa’s branding had a number of colors in it, but with the photos she provided, it just felt right to zero in on the pinks and purples. love the fun colors and the design is FAB, great job!! Fingers crossed I get more clients soon, haha. Thank you! I love this!! You did a fantastic job! I want to hire you to do a media kit for me but I need to wait until I rebrand and launch my blog with my new name. All that is holding me back is getting my blog redesigned! Great job! I love this design! Great job! Thanks for sharing! This is a fantastic media kit – having spent 10 years in advertising, it’s wonderful to see such a put-together, professional approach to marketing your blogging presence. Very inspiring! Thank you so much! I know not every blogger has the budget or the know-how to put together a professional-looking media kit, but most of my clients come to me with professional photos and fantastic copy and it’s so easy to take that and make it into a good-looking, streamlined, eye-catchy bit of print design. That’s what I go for at least! Gorgeous! I’m in the process of revamping my media kit and this is absolutely beautiful! Thank you! Would love to see your media kit when it’s finished! Um I’m pinning this right now. I love it! Great job! I like the final logo. This reminds me that I need to get a media kit. Looks great! It’s really awesome that you share these because it seems like bloggers always say “you need a media kit to work with brands!” but few actually show what they look like or the information they include. So yay for putting examples out there! Yes!! Exactly. Part of my sharing my work is obviously putting it out there for myself, for self-promotion, but I also feel responsible for helping people DIY their own stuff. That’s what I’ve been doing since I started blogging, since I’m too broke to hire or buy anything. And nothing helps me more than seeing completed projects, which made my first few media kits a little difficult to design! Now I can show my clients my portfolio, or they already come to me having seen my portfolio and point out “I like what you did there, and how you laid this out” and it makes everything so much easier. This is amazing!! I really have to put together a media kit, thank you so much for sharing. Looks amazing! I am in desperate need of getting my media kit updated! Thanks for the inspiration! Looks amazing! Pinning it as a reference when its time to update my own media kit. Ok… Looks like I got the nudge I needed to redo my media kit! Love this! Welcome to my blog! 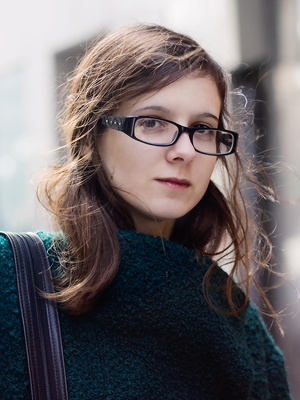 I'm Lix: full-time graphic designer for bloggers and freelancers, and part-time photographer. I'm an unapologetic cat lady and perpetually angry feminist nightmare. I like attention and pretty things, and that's why I run a lifestyle blog. Learn more. Sign up for bimonthly news, links, secret content and exclusive offers! © 2019 Lix Hewett, all rights reserved.